Color code : shades of red, orange , with black stoles. 8.20 departure for Chawri Bazar from Hauz Khas. 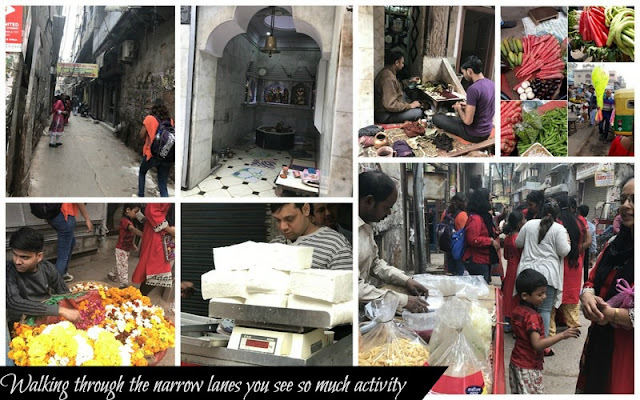 Chawri Bazar is a specialized wholesale market of brass, copper and paper products.Established in 1840, with a hardware market, it was the first wholesale market of Old Delhi it lies to the west of Jama Masjid in Delhi. Road side Aloo Parathas with green garlic spicy chutney and pickle. The Paratha were made live..yes in front of us, hot Parathas ! We took just one and were tempted to have more, but No! 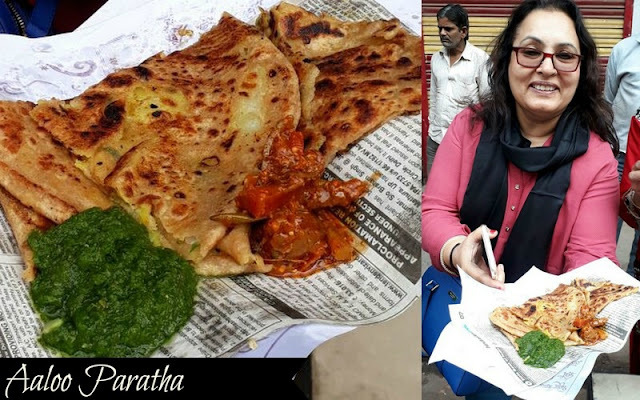 The stuffing of Paratha had boiled mashed potatoes, a bit of onion, green chilly , coriander, red chilly powder and salt. Walk 10 meters and a vendor frying hot Bread Pakoras. 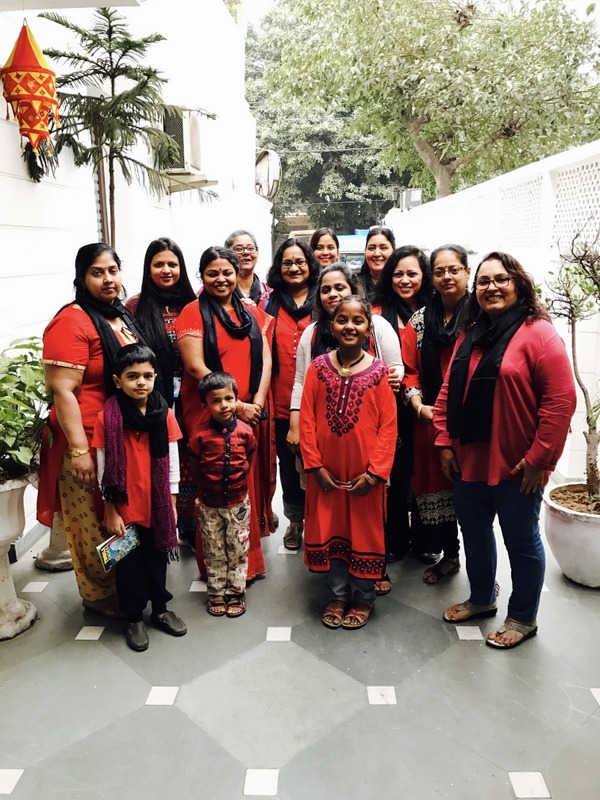 Girls in red surrounded him, clicked pics and videos, took recipe and bought one plate of the bread Pakora. Surprise ! It was served with Aloo ki Sabzi. I had never seen that before , perhaps a new addition to those regular bread pakoras. 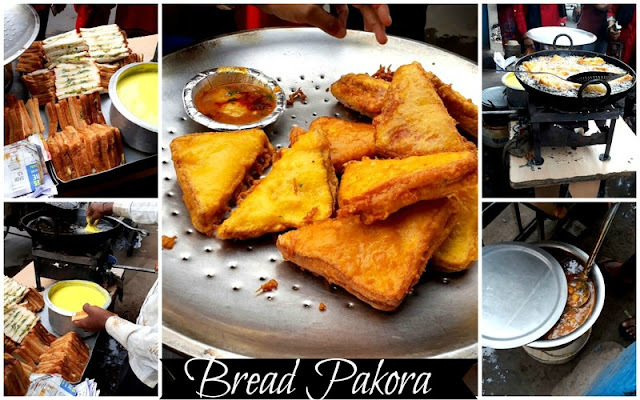 The bread pakoras had a stuffing of boiled mashed potatoes,cut into triangles and dipped in Besan, a bit of all purpose flour, turmeric and salt, finally fried to a golden. 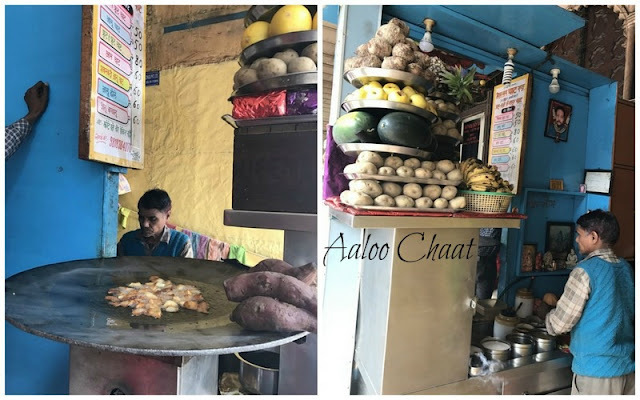 Rs 30 for 2 pieces with Aloo ki sabzi. Next station Half way along Chawri Bazar, on the right going towards Jama Masjid . Bedmi is a wheat flour Poori,a lighter version of kachori, served with Aloo ki sabzi and a crunchy carrot pickle. 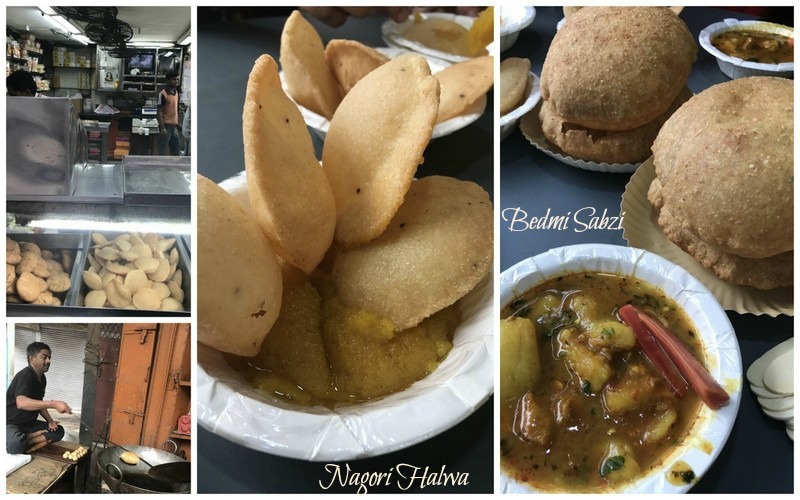 Nagori are small Pooris made from semolina , served with Sooji ka Halwa. Can’t understand why this name, because it is not a chat ! Milk and cream are beaten together and made frothy, this froth is then served with powdered jaggery and some froth which has saffron. The powdered jaggery works as praline, gives it a amazing crunch. Our girls- on seventh moon . We walk through the narrow lanes of Chawri and go into Kucha Pati Ram, Bazar Sita Ram. The shop opens at 9am, but it was closed. One phone call and it opened right away. Mango , Anar, Orange and Apple. 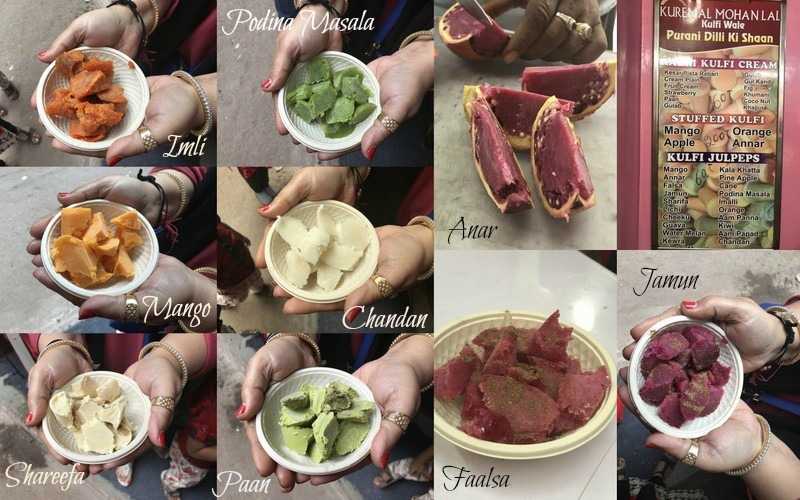 These are whole fruits, cored and stuffed with kulfis and frozen. These were water based, sorbet kinds . Trust us to enjoy these kulfis early morning ! We took one plate and clicked it on a cart. We thought of Rajani at that time, the cart was just the kind of board she would like. 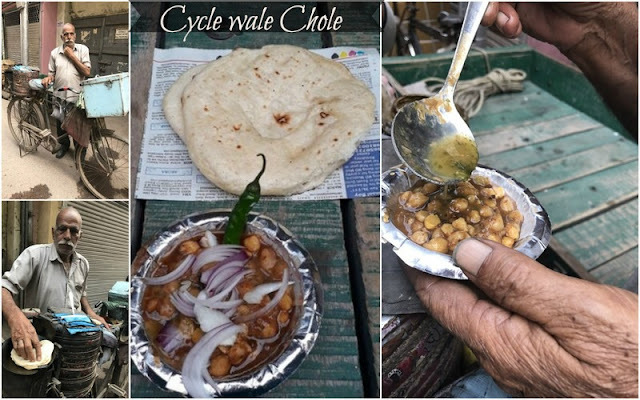 These cholas are made without onion and garlic, just chole and spices, then enhanced with mint and tamarind chutney. They are packed in a large tin container and covered with layers of woolen fabric so that they can remain hot throughout the day. They are served with kulchas from the local bakery. 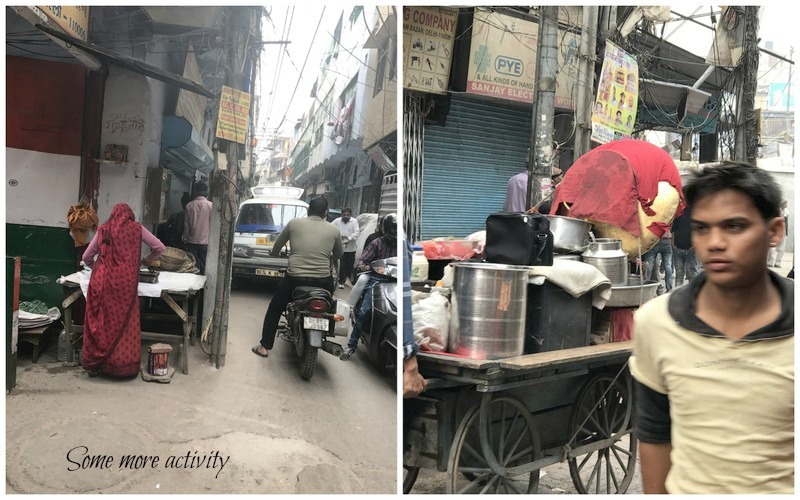 We half heartedly finished Chawri and decided to go to Chandni Chowk. The distance is not much but walking through the busy lanes in a group was tough. Ę rickshaws come to rescue. Gurudwara Sis Ganj Sahib , we sat and heard the holy shabad and had Karah Prasad. One of the nine historical Gurudwaras of Delhi. It marks the site where the ninth guru was beheaded on the orders of Mughal emperor Aurangzeb for refusing to convert into Islam. We continue with our food tour. Boiled potatoes, cut into cubes and deep fried, mixed with boiled cubed Kachaalu. Spiced up with a special kala chat masala. A treat by itself, there are more varieties but I observed from the expression that they found the chat very tangy and spicy. Yellow Moong Daal fritters, jazzed up with grated radish and a spicy tangy green chutney. 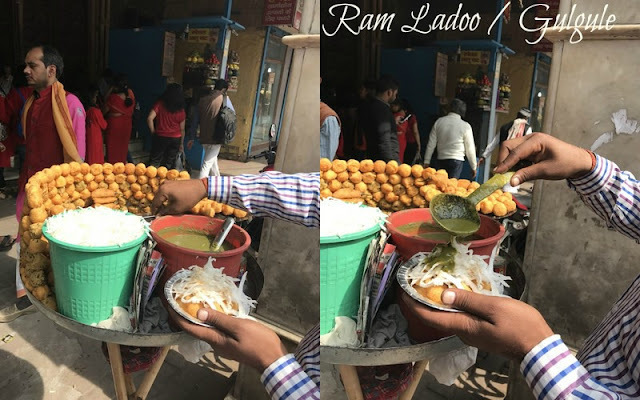 The best ram ladoos are available in Lajpat Nagar market, but we were short of time so had to make do with what was available there, though these were excellent too . Lentil dumplings dunked in fermented water, spiced up with chutney. I guess you need to develop taste for this , most of the people liked it, and it is my favorite. These are deep fried savouries made from Bengal gram. Jazzed up with creamy whipped curd, sweet tamarind chutney and spicy green chutney. 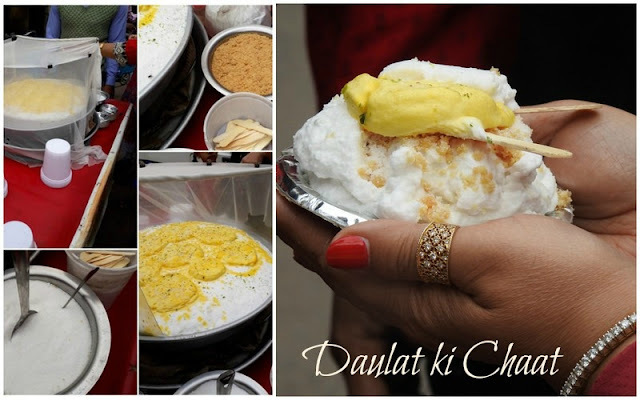 These have kind of disappeared from the markets, and are available only at selected stalls in Old Delhi area. 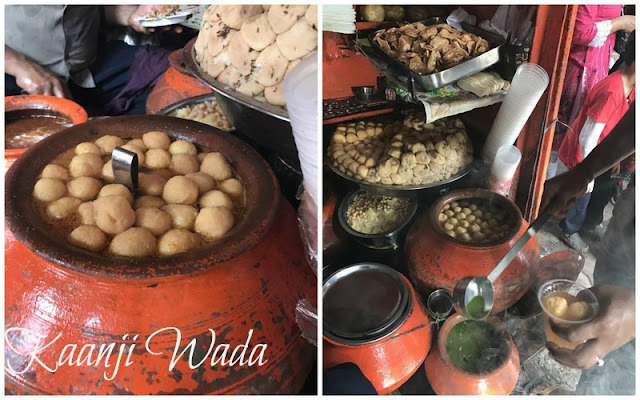 Melt in the mouth Dahi Wadas, these dahiwadas have nostalgic memories, as they are in the lane where my maasi had her jewellery shop. The same place serves Aloo tikki, nice and crisp. By now everyone was exhausted with walking and eating. 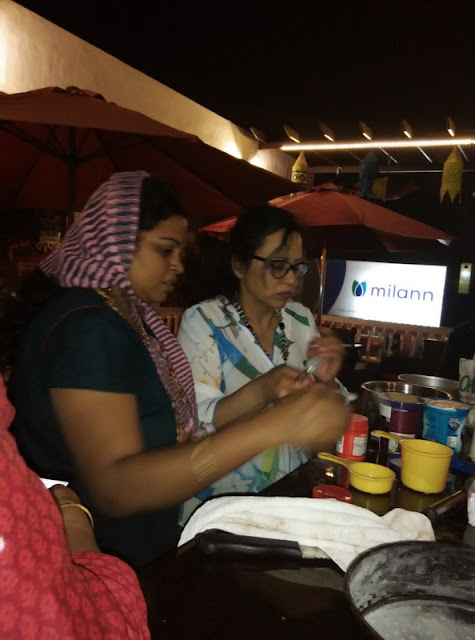 So some friends took a break and sat at Haldiram. Kids had their shake at Keventers, a renowned place for shakes. We could not miss the Parathe wali Gali so decided to make that the last stop. Quickly went in and clicked some pics. Pradnya got a couple of Parathas packed. The paneer cheela served with grated radish and carrots and chutney. Sandwich burger served with chutney. Two bread slices are stuffed with some grated paneer , dipped into a gram flour batter and shallow fried on a gridle. This is then ripped open from one side and a Tikki is stuffed in. Again this was just for tasting. A bit of shopping and we decided to leave this bustling area. Ok are you guys tiered? 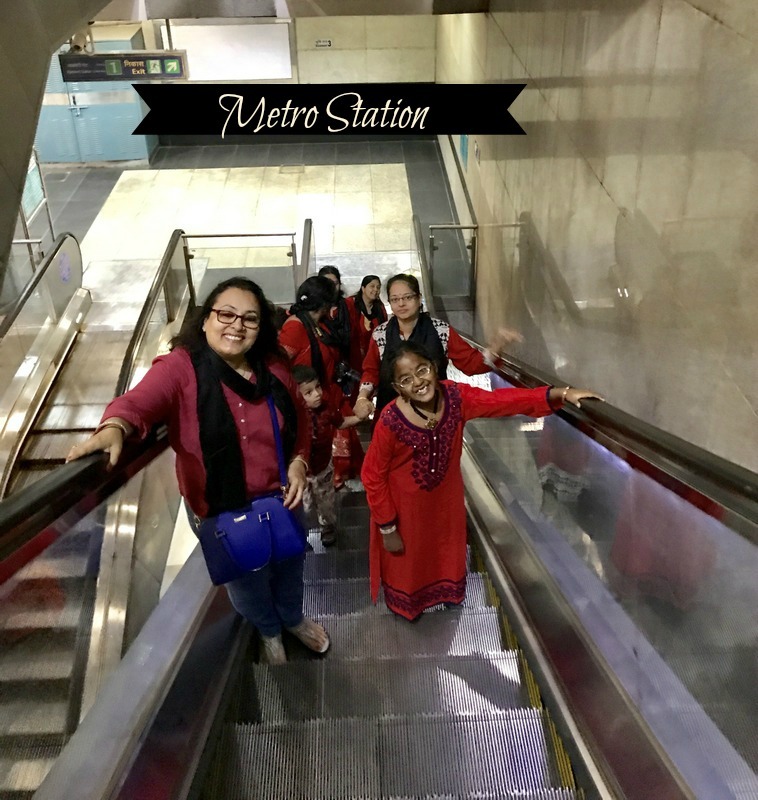 Archana, Apeksha, Pradnya and Valli off to shopping. We had a variety of junk throughout the day so I made a bowl of salad. 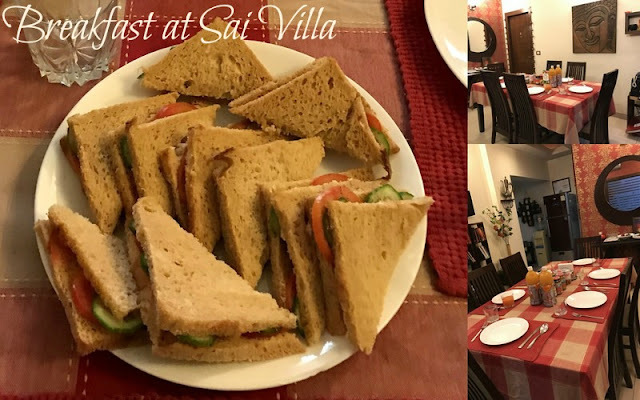 But food was called for from the restaurant, served with hot chapatis made at Sai Villa. Left overs from yesterday too were served. I really did not look at that food and was very happy with my salad, which was a mix of cucumbers, apples, onion, cranberries and walnuts dressed with salt,pepper and lemon. 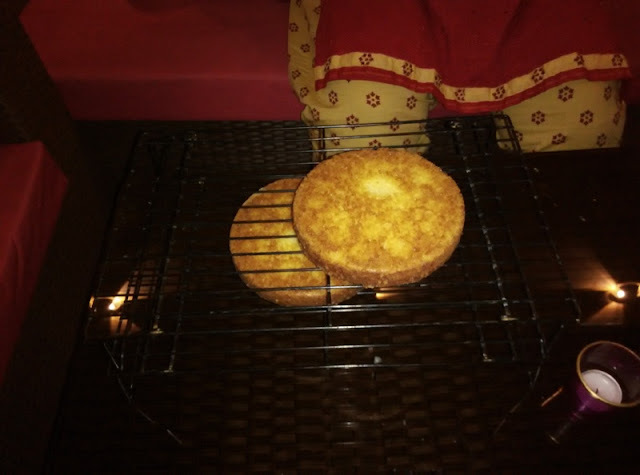 Even though everyone was exhausted Gayathri baked a couple of cakes for the next day’s workshop. A couple of us dancing . I made a couple of calls but all in vain. So will wait for the sunrise . 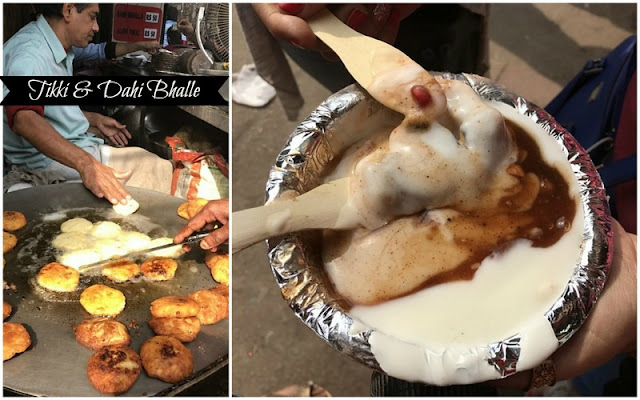 Lying down in bed realized that we missed the jalebis of Dariba Kalaan, where each jalebi weighs 250 gms or more with the juicy syrup dripping all over. One can’t stop licking fingers ! With thoughts of the day gone by and the day to come I slept off. Come back tomorrow to check what we shall do . ← Blogging Marathon #75 Celebrations, The side Trip. 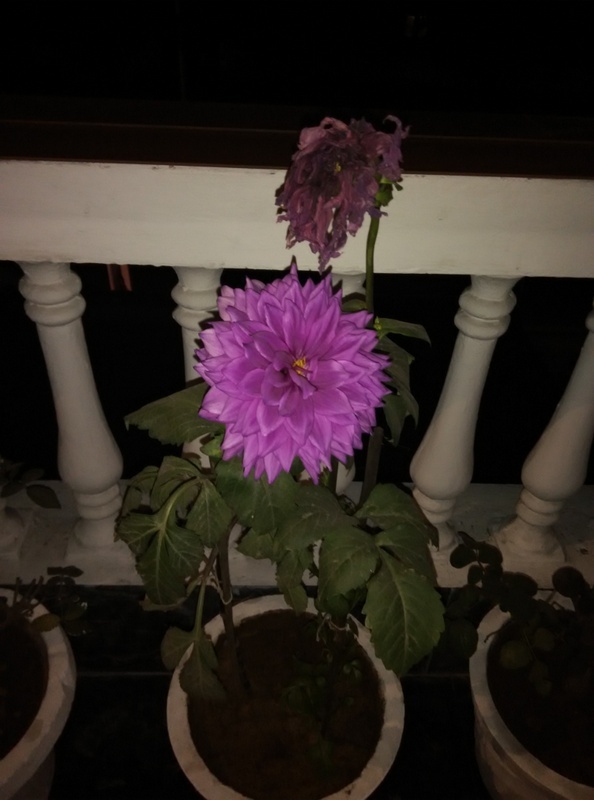 Viashali, lovely post and enjoyed the virtual tour. More than anything, I finally solved the mystery lady with a ring on her thumb!! Each time I saw that ring adorned thumb in all the posts and photos, I wondered who it was and today I was even going to ask in the group!! It looks lovely on your thumb. Lovely food tour!! I wish i were with you guys!! Really enjoyed reading each and everyone of yours. very nice. Excellent writeup . I would love to explore those place one day. 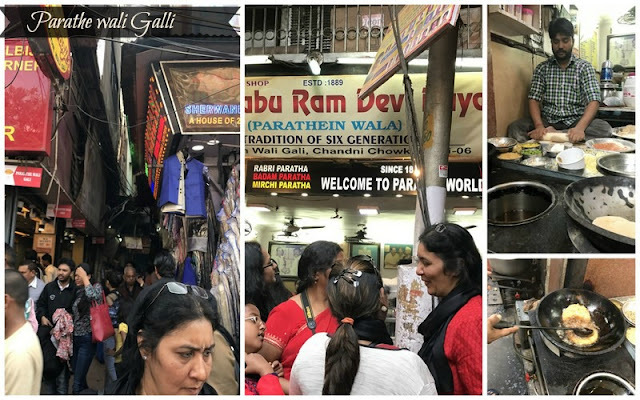 I wish I could do a food walk through Delhi. Your clicks are making me drool and wish I was there with you. Am adding Delhi in first, to my list of place to visit if am travelling to India, so much of foods, seriously am drooling over all those foods. I just can't forget the food we had on that day. And you made me dance! It was so nice that day..
Lol Usha! I know of toe rings this thumb ring was new to me. 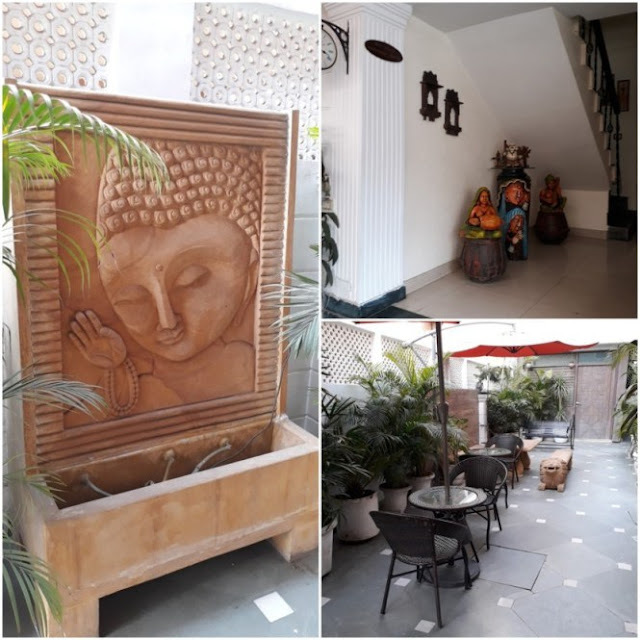 Loved the time we spent here Vaishali. I am hoping I make it Delhi once again and visit all those places again. Lovely compilation of your trip. hahaha…lol on Usha's comment..I had mentioned in beginning that it was you..:)..anyway another set of pictures all so nicely done..I think of the yeast and the stress gayathri had! Can I have a paratha plz??? The foodie trip looks awesome! Missed all the fun.